Duane Allman’s 1959 Gibson Les Paul Jr. This was Duane’s first ever electric guitar. He mentioned it in a letter to a friend dated July 1961, and according to Galadrielle Allman [Galadrielle Allman: Please Be With Me, p. 65], Duane paid for the Gibson electric himself by selling the parts of the motorbike that he had driven into the ground. According to some other sources, the guitar was purchased by his mother. 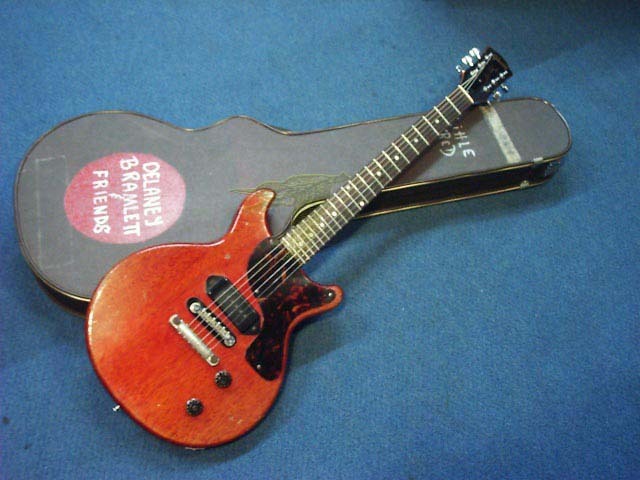 Duane used this guitar from 1961 to around 1964/65, when he allegedly pawned it. Some years later Delaney Bramlett walked into a pawnshop and randomly purchased a red Les Paul Jr. When he showed it to Duane, he supposedly recognized the guitar as his own by a gouge/scratch on the back of the body. There is, of course, no way of actually confirming this, and many aspects of this story seem way to random to be true, but that’s what happened at least according to Delaney. Delaney later sold the guitar to a San Francisco guitar collector, after which it changed hands again and ended up with Kunio Kishida, a collector/musician from Japan. [Kunio Kishida Goes Back to His Roots with His 8th Album “Slide Angel”] The guitar now often resides at The Big House Museum in Macon, GA where it can be seen on display. Duane’s Gibson Les Paul Jr. – Photo kindly provided by Kunio K.